There are a lot of things I love about the holiday season. One example is seeing the pretty lights and decorations everyone puts up in their homes and businesses. I also enjoy special holiday food dishes, Christmas music, and the parties where friends and loved ones gather. What I don’t love is trying to find a gift for someone who is hard to buy for. For instance, it isn’t always easy to give your boss a nice holiday gift they will like. If you have this problem too, here are some things I‘ve learned about giving your boss a nice holiday gift. The first thing to do before picking out a nice holiday gift for your boss is to set a budget limit. Review your budget to see what you can afford. That way you won’t blow a small holiday gift budget on your boss. 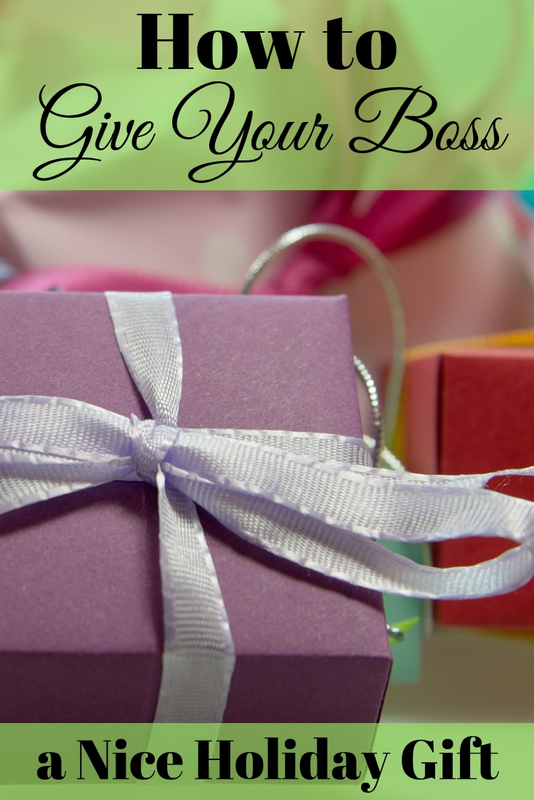 You should get to know your boss before deciding on what to give them as a gift. I know this isn’t easy if you have a supervisor who is a very private person. But, with time and careful observation, you shouldn’t have a problem learning a few things about your superior. Does your boss frequently drink coffee? Maybe you could get a nice, aromatic blend for them this Christmas from Starbucks. Or, do you notice that your boss likes to get her nails done? Give her a gift certificate, or other package, at her favorite salon. If you pay attention to the habits of your boss you should see opportunities for gift giving. So, watch what your boss does and listen to what he says and you’ll find the perfect gift for sure. Something to keep in mind when trying to give your boss a nice holiday gift is not to go overboard. It can be easy to do when you want to show your appreciation of them. Remember, you don’t need to impress them with a pricey gift: let your performance on the job do the talking instead. When it comes to gifts, keep it simple, but well presented, by wrapping it beautifully. After all, the last thing you want is to encourage thoughts that you’re trying to brown-nose, or buy –off, the boss. If you really can’t afford to give anything expensive, an extravagant gift will leave a bad impression. Did you know that some businesses prohibit employees, including bosses, from accepting gifts over a certain dollar amount? If you wonder whether or not to get your boss a nice holiday gift, check your employer’s policies first. Make sure you follow them before sending the wrong message with a gift they can’t accept. When you’re trying to save money for the holidays, but give a nice holiday gift, even bosses enjoy homemade gifts. If you can bake, sew, or craft, maybe something small that you’ve made just for them would be appropriate. One way to give your boss a nice holiday gift is to give them something useful. As an example, give them a small gift card to a favorite lunch hang out. Or, wrap up a new mousepad to replace the worn one at their desk. Office supplies and other small items can make great gifts that your boss will use and enjoy. Another option is to package a food item they like and can stow in a desk drawer for snacking purposes. Picture frames with a photo of everyone in your work group are also nice. Some gifts just shouldn’t be given to a boss of any kind. Clothing, perfume, and lingerie are generally not appropriate for a supervisor or boss. Reserve these gifts for those you know well, like family and friends. Even though it isn’t easy to find a nice holiday gift for your boss, it is possible to find something appropriate. Try these tips to help you decide on something both suitable and affordable to give your boss this holiday season. Have you decided yet what to give your boss as a nice holiday gift this year? Nice article on gift ideas for office purposes.